Lekha's pearl and gold multi-strand jewellery adorning her hair, surrounded by a halo of jasmine flowers creates a vision of prettiness. Notice the unique and interesting pleating of the saree! The Maharashtrian style of draping and pleating added a unique touch to her wedding attire. The couple decided to ditch the usual floral scene and go green by using aesthetic leaves with pops of red and yellow in their varmalas. 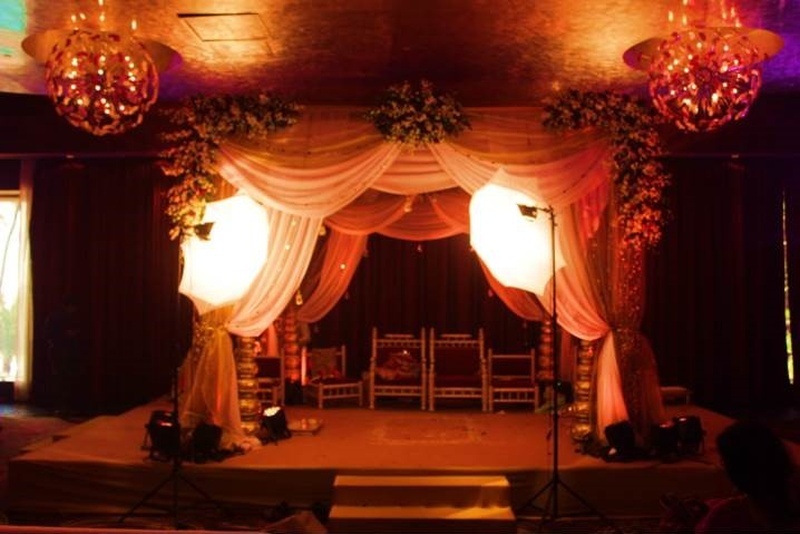 What we fell in love most was the warm mood of the mandap decor. The orange, red and gold tones looked all the more amazing complimented by the yellow glow of the lighting. Majority of the wedding decor at Lekha and Sumeet's big day was stunningly decorated floral centrepieces and installations. We loved the classic colour palette of white and red.